You will be given a reference e-book to read which has 450 pages And the test will be based on that e-book , you can take final test within 1 year of purchase. 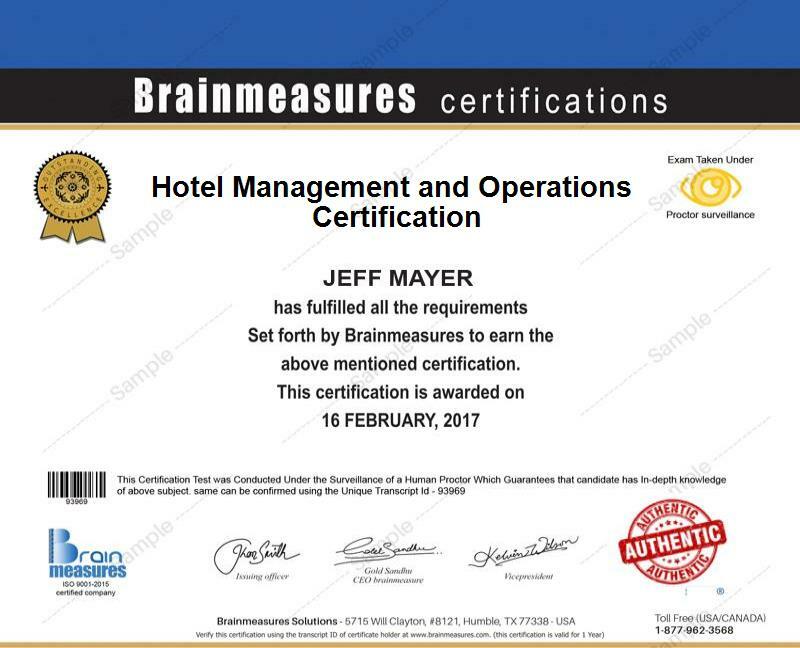 Enrolling in the hotel management and operations certification program which is now available at Brainmeasures is the best thing that you can do in case you want to increase the level of your understanding about how to successfully manage and operate a hotel establishment. By enrolling in the hotel management and operations course offered by Brainmeasures, you will be able to easily hone your skills and significantly increase the level of your knowledge about your specific field. With the help of this online certification course, you will be able to enjoy a well-detailed hotel management and operations training which is guaranteed to work in your attempt to understand the scope of this field, its major functions, the specific tools and strategies that you can use to effectively manage your daily hotel operations and the duties and responsibilities that you need to fulfil to become a more effective hotel manager. Once you receive your hotel management and operations certificate, you will no longer experience difficulty providing proof that you have what it takes to become one of the most effective hotel managers in the industry. How to choose the most profitable hotel reservations? The hotel management and operations certification program which is made easily accessible at Brainmeasures is one of the most beneficial online certification courses for all those who long to be part of the hotel and accommodations industry. It can work suitably for all aspiring and existing hotel managers, hotel owners, hotel operators, front desk managers, hotel supervisors and any other professionals who are responsible in making sure that the daily operations of a hotel are managed successfully. A higher level of salary can also be expected as soon as you take a hold of your hotel management and operations certification. Your hotel management and operations certification can be your ticket towards getting the position of a hotel operations analyst which allows you to enjoy around $32,000 to $65,000 per year. You can also use your certification to work as a hotel manager which gives you the chance to enjoy up to $158,000 annually.